Maybe you've been wondering about my Colorado trip report, and that makes two of us! The mood has finally struck, so sit back and relax while I fill you in on one part of the trip. My niece is a nursing student in Pueblo, about an hour south of her home in Colorado Springs. She has an anatomy and physiology class and lab that lasts five hours, which she couldn't miss, so I rode down with her and borrowed her car while she was in class. Presumably, the weed killing agent was tobacco smoke?! 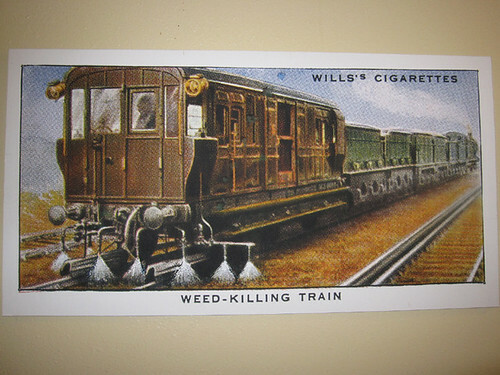 I know from other research that cigarette smoke misters were popular for killing houseplant insects in the mid-late 1800s, so, why not a train?! 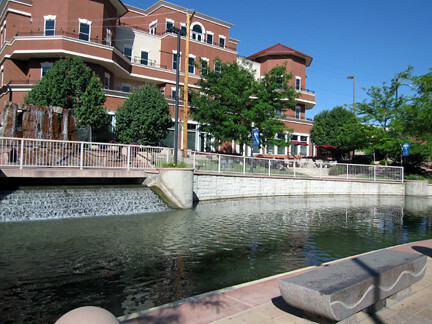 I also walked along the Historic Arkansas Riverwalk of Pueblo, a 1.3-mile paved walk along storefronts, some garden beds, the river, and Lake Elizabeth. (Note the cute squiggly bench. Ever since Phoenix C started posting photos of benches, I notice them everywhere!) Now, I can walk 1.3 miles no problem, no questions asked, any day of the week. But it was hot as a kitten wearing mittens in July in Pueblo, and I was wilting! Colorado has very low humidity and while it reached the low 90s each day in The Springs, it felt comfortable and much much cooler than humid Michigan feels in the same temps. But it was over 100 in Pueblo and that's just too hot no matter how you slice it. 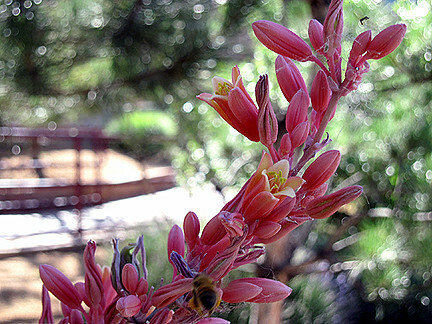 These lovely Yucca flowers along the walk were cool, though. This photo is a bit washed out because part was in shade and part was in bright sun, but the bench is for Phoenix C and the public planting is for VP! A cool window display. 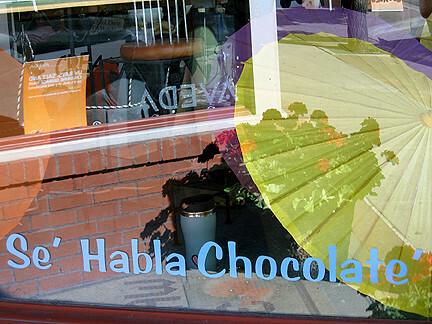 Why, yes, I do speak chocolate; in fact, I'm multilingual! 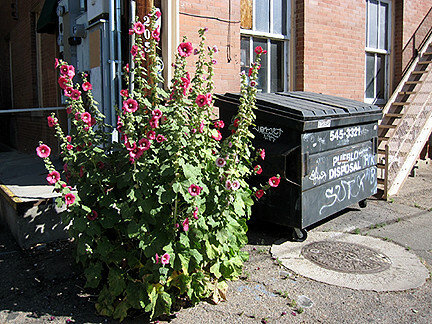 I noticed this grouping of hollyhocks growing out of cracks in cement in an alleyway, which I thought was really cool. I didn't realize hollyhocks were so xeric. Some seeds may also have fallen into my purse, la la la la. Next, I drove around a bit trying to locate a nursery for which I'd seen a billboard from the highway one stop before we exited. My sense of direction is pretty good, but I didn't realize I had to go through a park, which was blocked off with barricades, to reach the nursery until a little later when I entered said park from another street and kept driving until I saw a greenhouse. Presto! There was Star Nursery, a wonderfully retro little storefront and some nice plants, especially shrubs. 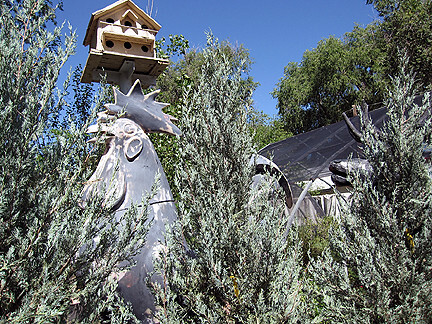 It was an eclectic place that also had Colorado's oldest pueblo structure as a mini museum on site, as well as some fun sculptures among the plants. I had a nice chat with a woman who worked there and ended up buying a cherry skullcap (Scutellaria suffrutescens), a tiny and cute sub-shrub reaching only 6" tall.Noogie! While cruising downtown and wondering what to do next, I noticed friendly words on an otherwise nondescript multi-story building: University of Colorado Cooperative Extension. Well, hello! That's the parent organization to the master gardener program. So I parked across the street and headed up to the second floor. I explained I was a master gardener from Michigan (why oh why didn't I bring my dorky name tag that I secretly covet?) 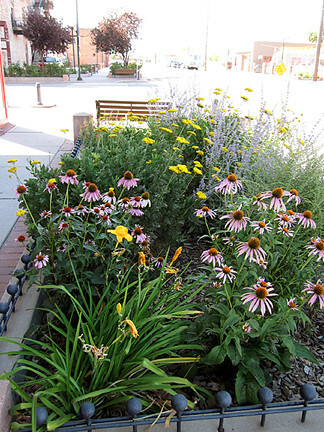 interested in Colorado native plants. I was sent back to the master gardener area. 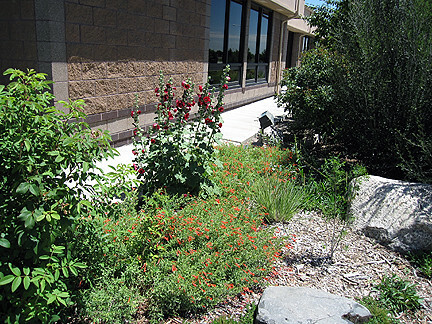 It's interesting how similar those offices looked to my local master gardener offices! I don't know if the man who greeted me was the MG coordinator or simply a volunteer. He was perfectly friendly and handed me a few general brochures about the MG program and gardening overall, but said he didn't have anything specific to natives. Now, I answer the master gardener helpline in my own county so I know that beyond the glossy brochures kept up front at the counter where the public enters, there's also a mother lode filing cabinet back in the offices that holds all kinds of less glossy but still useful brochures, bulletins, and fact sheets on any number of gardening topics that can be given out upon request. As I was mulling over how to broach this topic, a lady comes running down the hall, saying enthusiastically "Did I hear you ask for native plant info?" I explain my situation again and she's all excited. She walks me to said filing cabinet (I told you!) and starts pulling out all kinds of great info, all the while chit chatting about how wonderful natives are. Score! She also told me their extension started a native plant certification program, the Native Plant Master (what a cool name! ), separate from the MG certification, which is the first such program in the country! 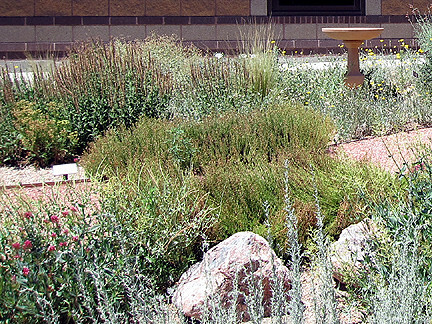 She asked if I had been to the Denver Botanic Garden or the xeriscape demonstration garden in The Springs, and I was glad to be able to answer yes to both. 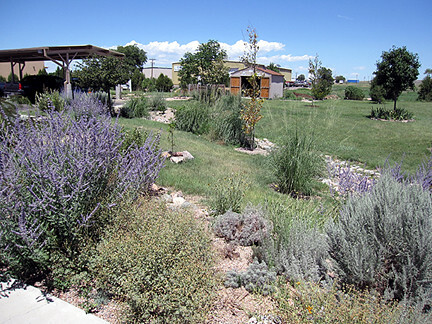 She then told me they had their own xeriscape demonstration garden in Pueblo, maintained by master gardener volunteers, and gave me directions on getting there. It took me a little longer than anticipated to reach the Southeastern Colorado Water Conservancy District Demonstration Xeriscape Garden because I unknowingly took the I-50 business route instead of the regular I-50/I-96 route, which took me, as they say in German, mit der Kirche ums Kreuz (that's way the heck out of the way in English)! When I arrived, several master gardeners were braving the heat doing some planting. I didn't have too much time now until I needed to leave to pick up my niece, so I unfortunately ran around the garden in a hurry. 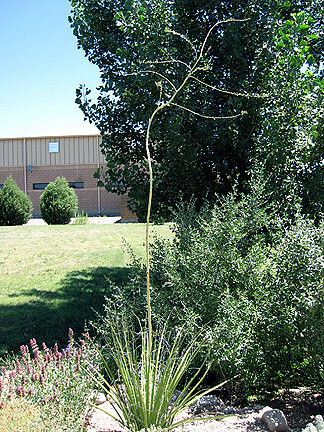 Crikey, that's one tall Yucca (erm, or possibly Agave or Hesperaloe or...)! I just love the spikey, wispy foliage, whatever it is. Again, hollyhocks like it drier than I'd thought. The colors were subtle but beautiful. 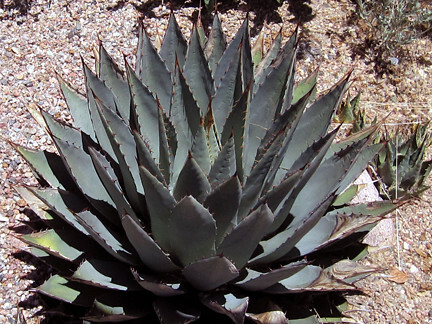 I just loved this Parry's agave (Agave parryi) and the fact that its common and Latin names are so intuitive! 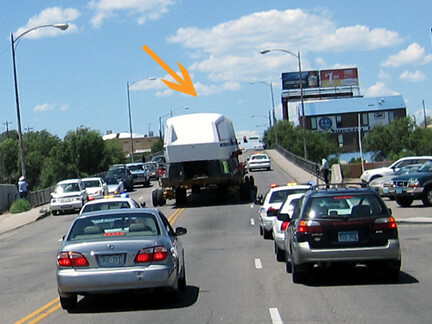 I would have been back to my niece's campus exactly on time had I not been caught behind this thing (Objectus mysterious 'Mobili,' marked with orange arrow). It doesn't look like much photographed from behind, but I got to see the whole thing when I finally found a road I recognized to turn off on. It was long and looked kind of like the front of a high-speed/bullet train, but it decidedly wasn't in fact a train. I still don't know what it was, and I only arrived a few minutes late. Except my niece's class had gotten out 15 minutes early. Ah, well, the joys of discovery sometimes take us a bit off course, doncha know! If you're interested in xeric plants, here's a list I put together some time ago of plants that don't need a lot of watering. I think chocolate is one of those universal languages. Isn't it funny how those seeds make their way into pockets and purses? What neat places you visited, though! It's so interesting to see the native plants of a different area, and I'm glad you found the excited Master Gardener to direct you to them. Aren't gardeners always excited to share their knowledge? :) It's funny to see the hollyhocks growing in such strange places, but then my prettiest hollyhock this year is growing out of my compost pile. What a great tour Monica! Interesting about those hollyhocks. 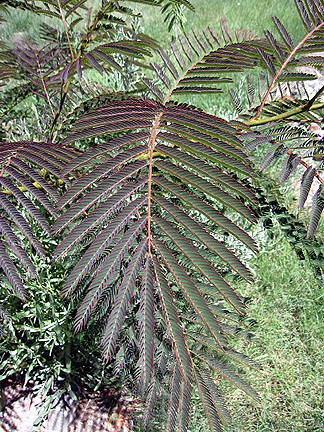 And so cool about the master of native plants (or whatever it's called). Loved this post. I'm trying to convert to more xeric plants. 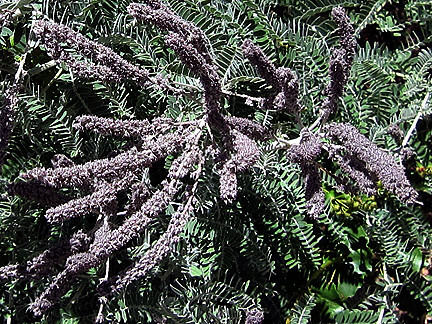 It would be interesting to visit one of the botanic gardens that specialized in xeric plants. I wouldn't have thought hollyhocks fit into that group either. I love them but there must be 10 different species of voracious insects that eat every part of hollyhocks in my area. Glad the mood hit you. This looks like a fun trip and to have found a mother load of native plant info is a bonus! That was a wonderful thing of that lady to come and share with you. I'll be looking for those file cabinets:) They'll never miss those hollyhock seeds and I would've done the same thing. Way to go! Hi Monica....the train station is so impressive. I have a thing for them.....I could spend (waste) time wandering around....they have such a fantastic atmosphere. I visited New York a few years ago and Grand Central was one of my visits. Oooh I loved it. What an awesome post. That train sending out the herbicide is so weird. Looks more like a liquid than smoke which is kind of sorta, scarier. Now I want to go through the MG program so I can get to enter private areas and browse secret filing cabinets. You guys are like the Freemasons or something of the gardening world. Now that is an interesting trip! Thanks for the links! I love the squiggly bench! The Master Gardener programme sounds great. It's also lovely the cameraderie you get when you meet other gardeners. There are some really interesting plants here. I'm interested to learn about xeric plants, so I'll look at your list now! What a fun day. I can tell you that hollyhocks are very xeric. The hollyhocks that grow where I work never are tended and they reseed themselves whereever a seed strays. Fun to find them popping up who knows where. Beautiful bench to sit in a lovely location. And the photos of the flowers are wonderful. PS I came via Sylvan Muse. I came over from Phoenix C who recommend your benches. I must say that the stone bench by the river was a rare beauty, but so was the rest of the post too. Exceedingly rare plants for us high up in the North! The train, the train! And the style of the illustration! I'm a hollyhock fan - and they may do well with little water but I would probably expect them to do even better with it. Wouldn't you think? Rambling back to the train - was this a poster of a cigarette card? So glad you are enjoying 'Hugh and Camellia' - but I'm not sure that you've found HUGH AND CAMELLIA on a white background. where you may find it easier to read. I've tried it out - and it should take you to the beginning, rather than to the most recent page. Depends which is most useful! HUGH AND CAMELLIA on a white background. Sorry about the deleted comment. Looks a little like the back end of a boat, partially covered with a tarp. Loved the tour, by the way. Excellent photos! What a wonderful adventure Monica! 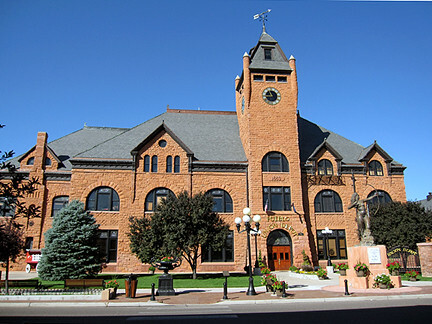 I've never been to Colorado Springs, and it was great seeing it through your eyes. (Except for Denver,) CO is one of my very most favorite states.